A Belgian studio has created a computer game based on the real-life events unfolding in eastern Ukraine dubbed ‘The Battle for Donetsk’. The creators claim the game is intended to promote peace and raise awareness. In the scenario you can pick either side of the conflict - a soldier in the Ukrainian army or a member of the self-defense forces in war-stricken Donetsk Region. “Are you ready? You determine the stakes,” says a slogan in a teaser of the game which showed the battle of Donetsk Airport. 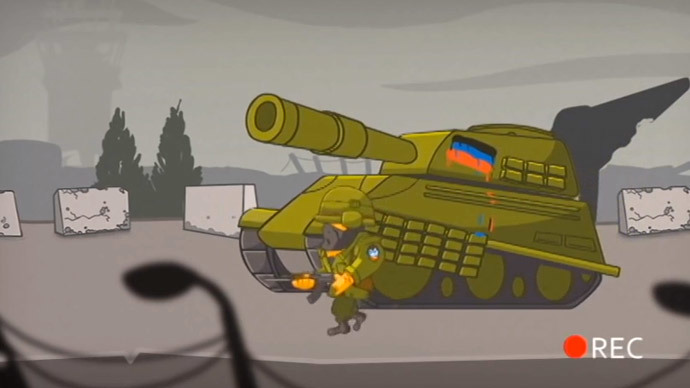 One of the game’s characteristics is that no matter whether you win or lose, you will always see a ‘Game Over’ message on the screen, a symbolic maneuver which probably refers to a never-ending Ukrainian conflict. “Game over! You won the battle but lost the game, a lot of civilians were killed.” This message appears on the screen after each battle, which shows the number of fatalities each time. The game’s developer, Kevin Haelterman, told RT that LuGus Studio decided to draw attention to the conflict in Ukraine as a lot of Belgians don’t know exactly what is happening there. The creators note that the Ukrainian conflict has also affected Belgium “in the form of higher gas prices and fruit that have lost their main export market." According to the developers, ‘Battle for Donetsk’ has recently made it into the top 100 of best new Android games. Donetsk Region witnessed shelling on a daily basis before the latest Minsk ceasefire agreement on February 12. The shells hit residential buildings, schools, hospitals and communal transport killing civilians. Both sides accused each other of being behind it. Pro- and anti-government forces were also fighting for the key area of Debaltsevo, a strategic railway hub, connecting the breakaway regions of Lugansk and Donetsk. Donetsk Airport has remained a battlefield in the conflict since May 2014. Now the international airport – which used to handle some 5 million passengers annually – lies in ruins. In January, self-defense forces of the Donetsk People’s Republic claimed they took control over the strategic airport, following an exhausting standoff with government forces.